If you spend enough time traveling along our local trails you are going to eventually encounter organized groups of people authorized to repair damage caused by erosion or trimming some vegetation crowding the trails. Sometime in October 1995, I answered the call to participate in the building of what was then called "Trail 4136". Burt was the crew leader. Burt took our inexperienced group of enthusiastic "trail builders" and showed us the tools and then described the jobs we were to perform. A few hours after starting we had fleshed out a switchback. This taste of sweat equity was my first time building a trail, and I can't help but smile each time I pass that corner. Years passed, and occasionally I would heed the call to volunteer some labor to work on a trail. Like flowers growing after the Winter rains, it was likely that Burt was leading one of the crews. Fast forward fifteen years, I began doing trail maintenance with the Trails Council on a regular basis. It was then that I began to appreciate what Burt did. I learned that Burt did not just work on the trails. He organized and planned the events. Burt met with NPS, COSCA and State Parks to create the trail work schedule; he brought the tools to and from the worksite; and along the way he mentored a few trail crew leaders. Just showing up and wielding a McLeod for a few hours pales in comparison to the amount of work Burt did to ensure the trail crew volunteers had a job to do. Burt set the bar up high for all of the crew leaders and volunteers. I particularly enjoyed telling the newer crew members that the septuagenarian over there was working harder than we were! Burt was the image of the man I wanted to be when I got to that stage of my life. He could run, hike, bike and wield the tools of the trail workers trade like a much younger person. Towards the end of his life, Burt handed me an Excel spreadsheet which contained a log of his work from 1991 to 2003. I scrolled thru the data until I came to that day in 1995 when I worked with Burt on the Rosewood Trail. I then noticed that the rows of data showed many more days on this trail. There are more than a dozen entries for trail "4136". I know how much pride I feel when I think of the one work day I shared with Burt on this trail in 1995. Imagine the effort involved to survey, flag, cut vegetation, remove stumps and then organize a bunch of humans to carve a path into chaparral covered hillside over the course of those dozen entries! Exactly how much time Burt put in is a well-guarded secret, but it is likely that whatever hours he submitted were a close approximation and might not include that extra visits to make sure the work was "just right." While I was busy riding and occasionally doing trail work, Burt was working nearly every weekend and often many days during the week, building and repairing the trails we love to travel. The years would come and go but Burt was an anchor - welcoming and drawing you back to work on the trails. One more detail about Burt's dedication: in his last year of life Burt put in fifty-seven more hours of volunteer work. To put that in perspective: chemotherapy treatment slowed him down but he still came out to work on the trails with his colleagues. The sheer number of trails that Burt helped to build and repair can only be matched by the most dedicated of volunteers. Just about every trail in the Conejo Open Space and Santa Monica Mountains has seen Burt's footprints. Burt estimated that he put in more than 10,000 hours of volunteer work. When he gave me the spreadsheet listing the activities, he mentioned to me that "probably nobody would be interested in the contents." It would be a big accomplishment to hike all of the trails that he worked on. Building and maintaining trails is the work that we do to benefit all trail users; and it connects us to the land in a way that simply traveling through does not. Burt knew and understood that, and we have benefitted from Burt's labor over the past twenty-five years and will continue to benefit. Lately, Trail 4136 (the Rosewood Trail to those did not take part in building it) is calling. Thank you Burt! Although I met Burt during trail maintenance in 2001, my most vivid impressions were of his encyclopedic knowledge of flowers and plants. When hiking to or from work sites, Burt would call out the names of each flower or group of flowers we passed. His demeanor was not one of showing off or trying to impress but rather seemed to merely be bringing our attention to one of the Santa Monica Mountains’ main attractions. I also thought he might be keeping his memory up to date so as to not forget the names of any of these jewels. While Burt was calling names, it dawned on me that this was my opportunity to learn. Burt would be my teacher. I began to practice repeating as Burt called them out in order to burn them into my memory. After about four or five names, my mind would go blank. Too many flowers, I had exceeded my capacity. I couldn't remember any of them. So I decided to limit myself to remembering only two on every journey. If after I committed two new ones to memory he happened to name one that was easy to remember, like “wooly-blue-curl”, I might add that one also. After a few months I realized I had learned many of those we passed. Being able to recognize most of the more common flowers has added greatly to my hiking pleasure, especially in the spring. While enjoying the sight of the various flowers, my mind frequently flashes back to what Burt had done for me and how it had happened. Remembering two flowers per hike and ignoring the twenty or thirty others he'd be calling off. I emailed Maxine, the widow of Milt McAuley, who knew Burt for many years. She said she didn't know Burt very well herself, but that Milt was very fond of him. She remembered Burt helping Milt identify plants, presumably for Milt's "Wildflowers of the Santa Moncia Mountains" book. 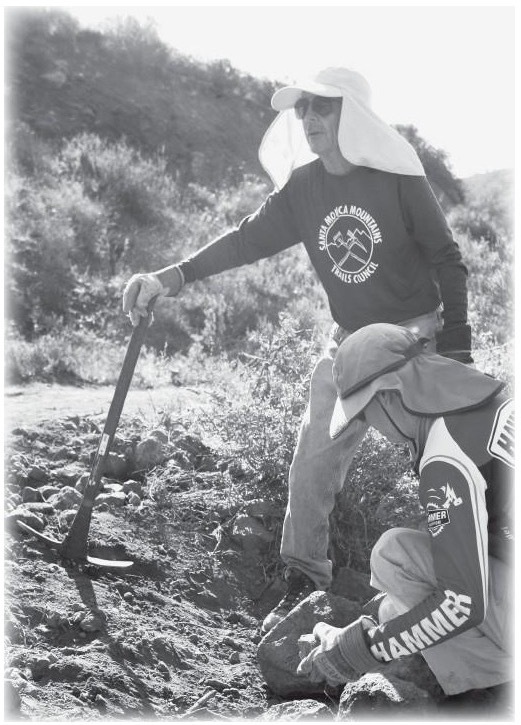 I can't recall exactly when I first met Burt, but it must have been in the early 90s, while working on a trail with Milt and other volunteers. I remember Burt as a very patient and easy-going man. The closest that I ever saw Burt come to being prideful was the pride he took in being healthy. His trail lunch always included tuna. One day he related how pleased he was with a health survey he had recently completed, in which he recorded how often he consumed tuna. Of course, in addition to diet, exercise was part of his healthy lifestyle. A strong hiker, Burt was also into trail running, biking and cross-country skiing, among other things. I am grateful for having known Burt, and I feel that he set a good example, for all who knew him, to follow.